From Farsi to Greek. Crossing the borders. The action was a comment on immigration, providing the colorful paved ground of the square, so as to welcome hospitality and cohabitation within the city. 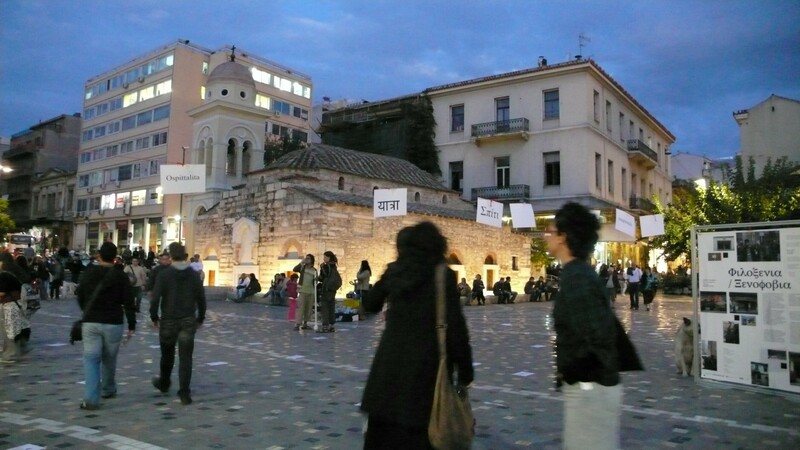 At the colorful cobbled square which symbolizes the multiculturalism of Athens, words were spread like borders, love, hospitality etc, in different languages ​​of different nationalities to remind the need for communication and social gathering of the city’s nomads in this square which becomes a crossroad. The need to overcome fear regarding the foreign and the different… The words we wrote symbolize specific meanings that are essential for the city center. The rope wrapped around us symbolizes the borders we constantly meet and the desire to cross them. During the POLIS 21 Citizen Culture and bounderies of the new city – ATHENS BETWEEN HOSPITALITY and XENOPHOBIA Co-organization: European Alternatives, SARCHA (School of ARCHitecture for All), Nomadic Architecture Network www.polis-21.com, 7 November 2009, Byzantine and Christian Museum of Athens.